Do the math and you'll quickly determine that's quite a bit more DPS than a 200mm Railgun Thorax can do on Tranquility. Something like 40% more. The response on Reddit has been interesting. 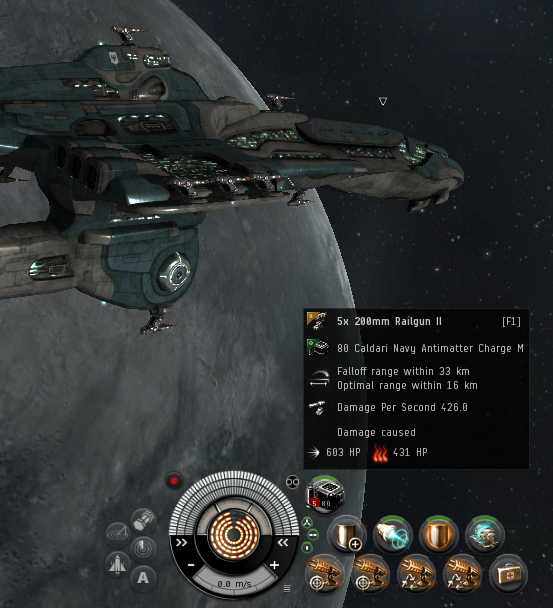 And who knows, I may get to again fly the sniper Ferox that CCP Fozzie promised me someday. Obviously, the CSM has been briefed on the exact plan, but I'll be quite interested to see player reaction to it when it goes fully public. Stay tuned. Where are the lazor changes? Especially the Tachs? Thank you for info. The moment I saw this I was on my way to get T2 200 and 250 rails in systems that had lowest price. But they ware gone before I could get there. Finally I got big load of them in low sec. Dosent matter if this is true or not.. price will go up. Great news and thank you for great info mate. I was fan of your page before... but you just help me to make easy ISK. Do you have any disclosable indication if CCP is looking only at medium rails (or all rails), or also say, medium beam lasers? I could be way off my rocker here, but with the same number of respective mods, an omen using FMBL II's currently gets 5dps less, at 7km less falloff, for slightly better tracking, and more cap use. Heavy beam laser II's top off at 356 dps, 18+14 range. A like fit omen with heavy pulse laser ii's with IN multi's only hits 407 dps. Are amarr being left out, or am I jumping the gun on being protective of my favorite race to fly? So now the medium beam lasers will be redheaded stepchildren of cruiser-class weaponry? Nice dancing around the NDA there! ah more DPS creep? just what the game needs I suppose. Well one of my mains does have all tech2 hybrids trained. the secret of eve is to hang around long enough for your "15minutes" of FTOM. a pity we can not see the rigs here. might also see an increase to the gap for the price between Deimos and Astarte. "Fifteen minutes of FTOM" needs to be a recurring eve meme.